The authors of this site, John Hesselberth and Ron Roy, have a strong belief that the glazes we potters put on our pots should be both durable in use and attractive. For too many years potters who have written glaze books and articles in magazines have paid attention only to the aesthetics of the glaze and not to suitability for use. The result has been a lot of glazes in the open literature that, while attractive, have one or more faults that make their use on functional pottery highly questionable. We now have two products to address this issue. 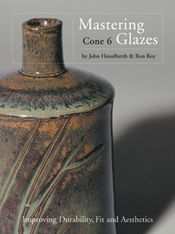 The first is the book "Mastering Cone 6 Glazes" first published in 2002. After 6 printings with over 18,000 copies sold, the original color version is now "out of print". While we do not plan to print more of the original version, the book is still available in 2 formats. The first, published in the Fall of 2012 is an eBook available on Apple's iPad, iPad mini, iPhone, and iPod Touch and is also now available on Macintosh computers that have been upgraded to the free Mavericks version of OSX. To buy it go to the iBooks app on your Apple device and search for it in the Store. The second format is a new Black and White edition that is "printed on demand" by thebookpatch.com. While the glaze photos are grayscale in this new edition, we have put color versions of the same photos on this website. Learn more about why we did this here. 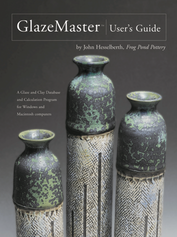 The second product is the glaze calculation program "GlazeMaster™" which serves not only as a great database for glaze recipes, but also as a tool to help potters design new glazes and analyze or adjust existing ones. It can be downloaded on the site and is now free. Both of these products are described in detail on this site and we hope you will enjoy learning about them.